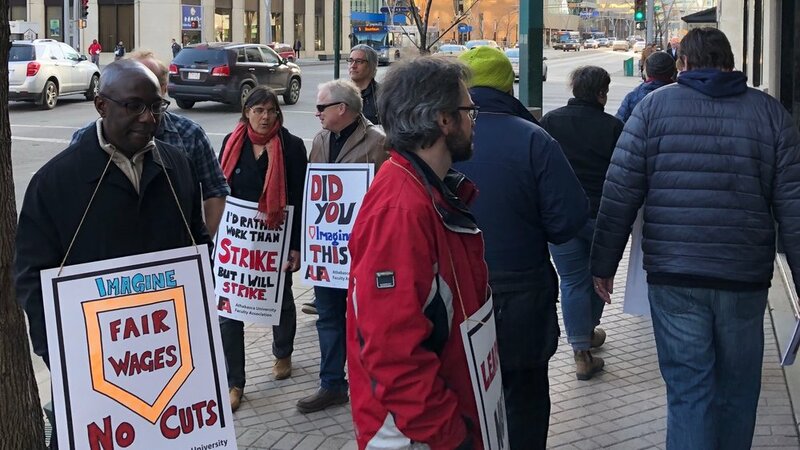 On March 28, Athabasca University Faculty Association (AUFA) members picketed the Athabasca University Board of Governors Dinner in Edmonton to express their dismay with a lack of progress in negotiation for a new collective agreement. A second picket is scheduled for April 15 in the town of Athabasca. Additional negotiations about cost of living increases in the final two years of the agreement. This agreement broadly mirrors settlements across Alberta’s public sector as well as the settlement Athabasca University just ratified with its support staff. It also addresses the University’s long-term mistreatment of term employees(an arbitration settlement last fall has forced the University to offer permanent appointments or make monetary settlements to numerous term employees). The University’s Board of Governors turned down AUFA’s proposed deal during a Labour-Board-supervised vote on March 21. The University and AUFA have met 18 times since bargaining began in May of 2018. One additional bargaining date is scheduled for April 15. The University and AUFA will be before the Labour Board to continue sorting out an essential services agreement on April 8. An essential services agreement is a prerequisite to formal mediation and a strike vote. If a new collective agreement in not reached, 40,000 students from across Canada could be affected by a work stoppage in the early autumn. Faculty have been without a contract since June 30, 2018. As you may be aware, VP Kristine Williamson sent an email regarding communications during the election period. Some members have expressed confusion and concern about the possible limitations. AUFA has sought information from Ms. Williamson, Elections Alberta, the Ministry, and sister organizations to clarify this communication. Last month, the Government of Alberta published its Election Communication Policy, which restricts “government advertising and other communications activity to ensure that governments neither involve themselves in nor influence elections.” Universities are specifically mentioned as an entity that is to comply with this policy which is available online. The Elections Act allows the University to continue with communications that are “continuous and “required” but the institution must ensure its communications are in step with provincial requirements during the writ period. The policy is not intended to limit or interfere with academic freedom and does not preclude staff members from engaging with political parties, their candidates or other political party representatives in conducting teaching and research. Athabasca University cannot make contributions (money or donations in-kind) to any political party or candidate running in an election. University funds cannot be used to cover the cost of attending partisan political fundraising or campaign events. University resources cannot be used to promote partisan political events or campaigns. This would include using your AU email address for partisan political purposes, including distributing campaign information, forwarding campaign materials received in your AU email inbox, or using university mailing or email lists to distribute campaign materials. Election signs and posters for candidates may only be placed on the publicly available bulletin boards inside university buildings. Signs placed elsewhere may be removed. AUFA will reiterate that the University must recognize the right of students, employees, and professional and academic staff members to participate as individuals in the political process provided they do not use university resources to do so. The pursuit of academic activity related to the election is an important and acceptable activity, subject to applicable legislative frameworks. If you are planning an event or meeting during this time where you would normally consider extending invitations to provincial elected officials, please contact your supervisor first. AUFA expresses deeply heartfelt condolences to all affected by the recent mass shooting in New Zealand, followed by the shooting in the Netherlands on Monday. AUFA joins in the mourning of the victims of this terrorism. In this time of sorrow, AUFA reaffirms that it strongly condemns racism, discrimination, and religious intolerance of any kind and urges anyone who experiences threats to contact the AUFA office. AUFA would also like to remind its members that if dealing with any distressed students, Athabasca University has a Counselling Services Unit that they can approach to address matters of a personal or sensitive nature. Is Athabasca University Prepared for a Work Stoppage? 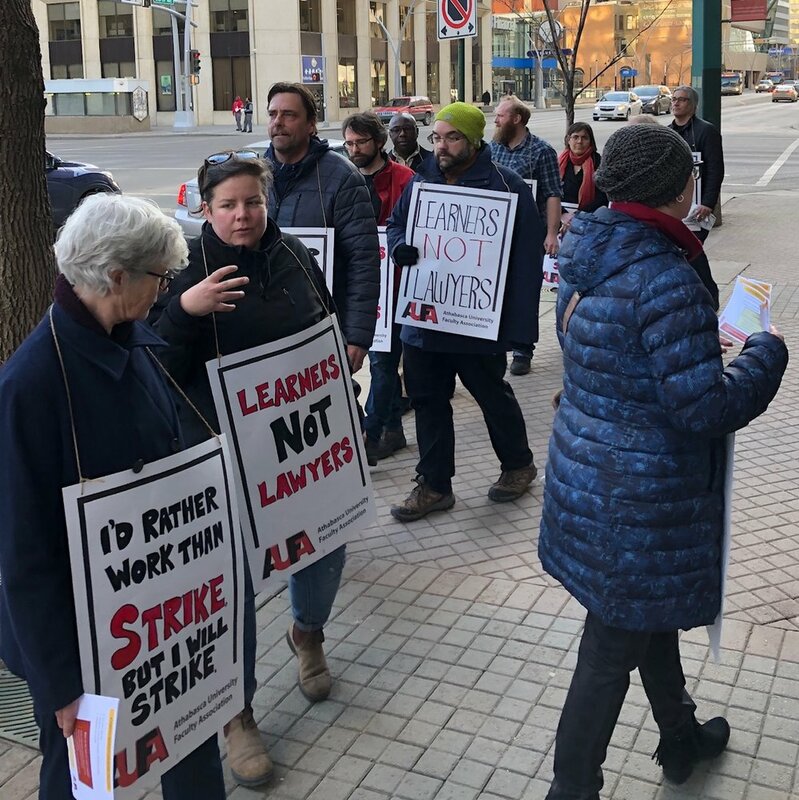 With the risk of a work stoppage ongoing, a number of AUFA members have raised important questions about how a work stoppage would work in practice. The work stoppage planning committee pooled these questions and posed them to Alain May (head of AU’s bargaining team) and Charlene Polege (AU’s Director of HR). Will AU be limiting or disabling AUFA members’ access to AU’s email systems during a work stoppage? This has implications for ongoing research and disciplinary service work. How will AU handle ARL, PD and vacation leaves that are underway when a work stoppage commences? Will the leaves be suspended for the duration of a work stoppage and then resumed once the work stoppage ends? AUFA members often book conference attendance months in advance. If an AUFA member is booked to attend a conference during a work stoppage, will AU reimburse expenses associated with conference attendance (which will mostly be incurred regardless of whether or not the member attends) from PD, APDF, and research grant funds? How will AU handle AUFA members on causal sick leave (of up to six months) during a work stoppage? Specifically, will AU continue their salaries or suspend such payments? How will AU handle AUFA members on Research and Study Leave (i.e., sabbatical)? Will such members (some of whom will be overseas) have their pay suspended? Will sabbatical be suspended and extended based upon the length of the dispute? How will the AU handle AUFA members on term contracts? Will their terms be suspended and extended (which may make sense if they are covering leaves that will also be extended)? Or will their contracts be terminated? Will term members who are CUPE members who are temporarily in AUFA revert back to CUPE appointments during an AUFA work stoppage? Approximately 200 AUFA members work from home offices and privately pay for telephone and internet access required for their job (for which they receive a stipend). Will AU continue to pay for these services during a work stoppage? If not and, consequently, AUFA members disconnect these services, will AU pay for reconnection fees (plus knock-on costs like new business cards, new letters to students)? Many AUFA members have possession of AU computers. Will AU ask that members return computers to AU for the duration of the work stoppage? Will AU attempt to remotely limit the operation of these computers (which, again, has significant implications for research and external service activity)? Some AU programs have practicum (or clinical) components where AUFA members teach and supervise students in a professional setting but that do not appear to meet the definition of an essential service (I’m specifically thinking about undergraduate nursing practicums). How will AU handle such practicums when notice of a work stoppage is served? Will the practicum be suspended and resumed? Or simply discontinued? I would expect that students would also want to know the answer to this question. AU has certain contractual obligations (e.g., to supply data to third parties) associated with grants. How will AU meet these requirements during a work stoppage? If AU cannot meet these requirements, will AU be alerting third parties to the disruption? Thank you for your email. At this time in the bargaining process we are focusing our energy on finding creative solutions that will result in a collective agreement. If and when there is a strike, we will share information that we deem appropriate within the 72 hour notice period. One explanation for this unsatisfactory response is that AU hasn’t put its mind to how a work stoppage would actually work. An alternate explanation is that AU is withholding this information as a form of leverage. And, of course, both of these things could be true. On February 7th, AU President Neil Fassina sent out a direct communication to AUFA members, other AU staff, and students in the form of an open letter and ‘Fact Sheet’ in an attempt to characterize the Board’s proposals as beneficial to AUFA members. Attached is Chief Negotiator Dr. Eric Strikwerda’s response to AU’s Fact Sheet. In good faith, AUFA will return to the bargaining table starting February 12th in the hopes that the Board team have changed or withdrawn their objectionable language. Please click the below link to read the AUFA response. On Tuesday, AUFA applied to the Labour Relations Board for a proposal vote by the Board of Governors (BoG) on AUFA’s most recent proposal. A few members have questions about this process and we thought sharing the answers might be helpful. 1. What is a proposal vote? Once per round of bargaining, each side can request the other side vote on a proposal even though the other side’s bargaining team has rejected it. If the proposal is accepted, then the collective agreement is settled. If the proposal is rejected, then bargaining continues. 2. Who votes on this proposal? The employer has the power to determine how it will handle a vote. The entire Board could cast a vote (with a majority rules arrangement) or the Board could designate a group or an individual to cast a ballot. 3. Why did AUFA choose to apply for a proposal vote now? We believe that the BoG bargaining team is taking a more aggressive stance than the BoG itself would approve. A proposal vote after impasse has been reached forces the BoG to recognize that their bargaining team’s strategy is not working. It also gives the BoG a way out (e.g., sign this pattern proposal and get 5 years of labour peace) before things escalate further. Bargaining coming to impasse is a disheartening event. Filing a proposal vote demonstrates that we are not passive victims and we still have power in this dispute. It also demonstrates that AUFA is doing everything it can to avoid an actual work stoppage (which is unnecessary, but for the employer’s intransigence). We could think of no good reason to save this tactic for a later time. If it is successful this dispute is over (so big potential reward). If it fails, it cost us nothing (so low risk). If it fails, it also demonstrates to everyone (e.g., our members, the government, students) that the barrier to resolution is the BoG. 4. What is AUFA’s proposal? A five-year contract (July 1, 2018 to June 30, 2023). A wage freeze in years 1 and 2. A wage re-opener (i.e., further negotiations) in years 3-5 with impasse resolved by arbitration. Four language improvements addressing on-call pay, spousal hiring, converting term positions to regular positions after a fixed period of time, and provisions addressing intellectual property. Numerous housekeeping proposals made by the employer. Some of these were included in the December 5 offer,and some were agreed to in January (and which AUFA would honour if AU accepts the December 5 proposal). 5. Can I see AUFA’s December 5 proposal? The proposal itself can be a bit hard to read, so we have posted a detailed summary here. The summary includes the entirety of the new language AUFA has proposed. We have also summarized the house-keeping items to reduce the length and complexity of the document. The actual proposal includes all of the language that is being struck out and makes for hard reading. If you really, really want to grind through the whole thing, we can send you several pdfs as well as the existing collective agreement (which you will need to read side-by-side with the changes). 6. When will the results of the vote be known? At this point, no date has been established. At present, we’re hearing probably 2.5 weeks, but it depends on whether AU objects to the vote of not. Obviously we’ll report the results as soon as we know them. Why is the Employer Acting This Way? The administration sees AU making substantial surpluses, and they want to earmark that money for their own pet projects, rather than staff compensation. Administration also sees current staff agreements as a source of funds that could go towards other items. Such items may include raises for senior staff, more personal assistants for executives and senior University officials, or money for projects and programs they are personally invested in. A previous Vice President Finance once remarked in a Board of Governors meeting that a raise in the AUFA bargaining unit of 1% would cost the institution about $400,000 per year. Based on our numbers, using the median income of the AUFA unit of approximately $100,000/year, that number is an accurate rough estimate. By these numbers, AU could afford a substantial raise for the AUFA unit while still putting money into reserves and other projects. Our current projected surplus is $9.1 million for this year, on top of multiple surpluses in past years. While we have mostly done an analysis of contract language in these blog updates, it’s worth commenting that so far AU has not even entertained a wage re-opener beyond years one and two (the years we are told the government has mandated zeroes). By offering a wage freeze in line with the rest of the public sector, AUFA is being exceedingly generous given AU’s current financial health. Asking for modest improvements to contract language -- instead of drastic cuts -- is a predictable and reasonable move. Another factor worth considering is our President’s own Academic research on “The Strategic Flinch”, linked here. In his research, Dr. Fassina puts forward (backed up with data) the idea that there is a strategic argument to be made for turning up the heat emotionally at the table and pressuring negotiations. During bargaining, there has been no shortage of emotional outbursts towards AUFA from the Board’s team, including castigating AUFA for refusing to sign language that is clearly not in the union’s interest, and accusing the union of bad faith when we have in earnest turned down language our own members rejected through our polling. If the employers’ package and the over-the-top pressure put on the bargaining team is simply an attempt to shift the “value proposition” of the bargaining, our best response for the union membership is to call the bluff and not give in. There is a good argument for us holding our ground. Allowing the employers’ tactic to work this time would invite more aggressive behaviour in the future and encourage unreasonable approaches to bargaining. The best way to deal with a tactic we don’t like is to not allow it to be effective, and in this case its effectiveness is largely up to us anyways. According to his own research, this leads to less desire to negotiate; in a real estate deal, for example, the likely outcome is a failure to sell a house. If impasse cannot be solved by the parties in collective bargaining, the outcome is a labour disruption. Lingering resentment, divisions in a small town created over tensions in its largest employer, and more bad press for the university then become entrenched problems. In the past, we have discussed the Athabasca University Board of Governor’s decision to appoint external legal counsel as their chief negotiator. It is worth noting what kind of labour law Chantel Kassongo practices. While there is no doubt that some employers will drive a hard bargain, there is also a line between that and outright trying to “break” the union with which you are bargaining. Typically, these are called union avoidance strategies; see Dr. Bob Barnetson’s discussions of these strategies here. Kassongo regularly uses these strategies, and further, employer groups frequently invite her to teach employers how to keep their businesses ‘union free’. While it may seem counter-productive for a lawyer who deals with unions for a living to teach businesses how to eliminate unions, it is a very lucrative line of work for some lawyers and Human Resources practitioners. These strategies include offering incentives to employees while bargaining is ongoing (like paid time off above and beyond what the employer otherwise usually gives), combined with punishments such as retaliating against members who file grievances, singling out union officers for different treatment, and failure to abide by timelines for the resolution processes in the collective agreement. Often a business that embarks on this path will hire a lawyer with some experience in these strategies in order to stay on the right side of the law, and to protect under legal privilege any discussions around said strategy. Generally speaking, some losses in labour board hearings and arbitrations are considered an acceptable outcome if the ends are sufficiently favourable to justify the means. It is easy to simply focus on the person providing these services, but responsibility for using these strategies rests with the Board of Governors. Why would the Board of Governors work so hard to antagonise the largest bargaining unit in their workforce? Why would the Board employ such a consistent and far-reaching union-avoidance strategy? Many comments made both at and away from the bargaining table indicate that the employer desires a greater degree of control over the workforce.This is generally known as Managerialism. As it stands, the employer has said they feel the protections for academic freedom at AU are too strong and have signalled that this may be a place they want to seek concessions from the union in future. They intend to start with professional freedom and then roll academic freedoms back from there. Most of the employer’s demands are to do with hiring, determination of duties, promotion, severance, the grievance procedure, and discipline. All of these exist as important protections against an employer’s ability to curtail the career prospects of its critics and its ability to target union activists. While many AUFA members are likely happy with their jobs at AU, we don’t have to look too far into our past to a time when most people felt extremely insecure. That kind of environment is not conducive to academic excellence, and it is not a coincidence that those years of insecurity and layoffs at AU were also years during which AU’s enrollments struggled and our budget was tight. Our members want to defend their rights because they have seen what a blank cheque in the hands of the Board of Governors to lay people off has looked like. Those years were not great for AU staff, for our students, or for AU’s institutional reputation. Athabasca University should be a workplace where employees are hired and assessed reasonably by their peers. Where discipline is not arbitrary. Where dissident voices are not easily silenced by those who have power inside the institution, and who in turn can be pressured by those who have power in society at large. Where work is assessed and distributed equitably, and where people who are experts in their field can appeal management decisions to their peers. These are basic questions of job security, of dignity, and of respect for the work our members perform. The Athabasca University Faculty Association believes that those who carry out the day-to-day work at AU have the best interests of the University at heart and should retain their ability to participate in AU fully in the way that they have until now. Athabasca University is currently a success story, and AUFA members deserve a lot of credit for that success. AUFA believe that the AUFA contract, and the rights that AUFA members enjoy through that contract, is essential for our continued success. Athabasca University clearly believes that AUFA members enjoy too much freedom, and that AU suffers from too much collegiality. It is absolutely baffling that an employer who is doing so well would jeopardize all of this progress simply to “fix” something that is clearly not broken. That said, we are confident that AUFA’s members are not buying it, and we are certain they have what it takes to stand together and defend their hard-earned rights. Not for ourselves, but for the good of AU and the many communities it serves. Bargaining Reaches Impasse - What Next? On Tuesday, collective bargaining between AUFA and the Board reached impasse. For reasons outlined in the bargaining update, AUFA’s bargaining team has been forced to conclude that no further progress towards a collective agreement is likely at this time. Here is a thumbnail sketch of what is likely to happen in the next few months as AUFA’s bargaining and work stoppage teams continue to work towards achieving a collective agreement. Continue Bargaining: Even after impasse has been reached, it is not uncommon for parties to resume bargaining at a later date. For example, political pressure on AU may cause them to reconsider what AU’s true bottom line is. Bargaining can resume at any point and is most likely to be the way that this dispute is eventually resolved. Negotiate an Essential Services Agreement (ESA): The parties are required to negotiate an ESA in order to maintain certain services during a work stoppage. The threshold for deciding which services would be maintained includes whether the cessation would endanger the health, safety, or life of the public. AUFA and AU met to negotiate an ESA on January 15. AU’s position at the meeting was that (1) AUFA members do not perform essential services and that, if they do, (2) those services can be performed by non-bargaining unit staff. AUFA expects these negotiations to conclude this Friday, and we will probably need to have the matter adjudicated. Commence Formal Mediation: When bargaining reaches impasse, either side can request formal mediation by a government-appointed mediator. At this point, negotiations continue in the presence of the mediator, in hopes that a final agreement can be reached. If a final agreement cannot be reached in mediation, a mediator will often issue a recommended settlement that the parties are obliged to vote upon. If both parties accept the recommendation, then it becomes the new collective agreement. If either party rejects the recommendation, then mediation is concluded, and the dispute continues. There is a 14-day cooling-off period following mediation. Strike Vote and Lockout Poll: Once the 14-day cooling off period ends, AUFA can apply to the Labour Relations Board (LRB) to hold a strike vote. The employer can also apply to hold a lockout poll. A successful strike vote by AUFA members is required before AUFA can go on strike. A successful lockout poll by the Board of Governors is required before AU can lock AUFA members out. Once a strike or lockout mandate has been achieved, either side can initiate a work stoppage, with a 72-hour notice to the other side. Proposal Vote: At any time during the bargaining process, either party can apply to the LRB for a proposal vote. As the name suggests, a proposal vote forces the other side to vote on a proposal. For example, AU may apply to the LRB for a proposal vote of AUFA members. AUFA members would then be given an offer to examine and vote on (accept/reject). If a majority of AUFA members who vote were to accept the proposal, then the proposal would form the basis of a new collective agreement. If the majority rejected the proposal, then the bargaining process would continue. Each side is allowed can apply for a proposal vote only once each over the entire course of bargaining. Such a vote gives each side an opportunity to do an end run around the other side’s bargaining team. The rationale is that bargaining teams may be holding onto a firmer position than the membership that they represent. The threat of an end run is intended both to discourage and to remedy hardline bargaining. Arbitration: The Labour Relations Code allows both parties to agree at any time to have a dispute resolved via arbitration (i.e., settled by a neutral third party). There are risks associated with arbitration, the key one being the tendency of arbitrators to “split the difference” between two positions. In our case, AU’s unwillingness to withdraw its most egregious proposals would leave AUFA vulnerable to the possibility that the arbitrator would accept some of AU’s proposals in order to “give” each side something. For this reason, the specific context of arbitration—that is, what remains in dispute—plays a significant role in whether this option is desirable or not. So what is the timeline for a work stoppage? •	Strike Vote/Lockout Poll: June at the earliest. Once achieved, a strike or lockout mandate is valid for 120 days (i.e., the work stoppage must start with 120 days; the work stoppage can continue indefinitely). Can AUFA win if there is a work stoppage? Yes. The key to a successful strike is to apply enough operational and political pressure to AU to bring them back to the bargain table with an offer that is acceptable to AUFA members. For example, the current Alberta settlement pattern is two years of wage freeze offset by language improvements for the workers and a wage re-opener (i.e., further negotiations on money) in years 3 and 4. The suspension (or threat of suspension) of instruction for a significant number of students will have profound reputational and enrollment impacts upon AU (particularly given that 50% of AU’s revenue is tuition based). This sort of profound consequence suggests that AU will eventually be forced to negotiate an acceptable collective agreement. There are similar examples available related to the work of AUFA’s professional members. What happens if AUFA members won’t authorize a strike? If AUFA members don’t authorize a strike, then AU will be able to impose its rollbacks on us through a short lockout. 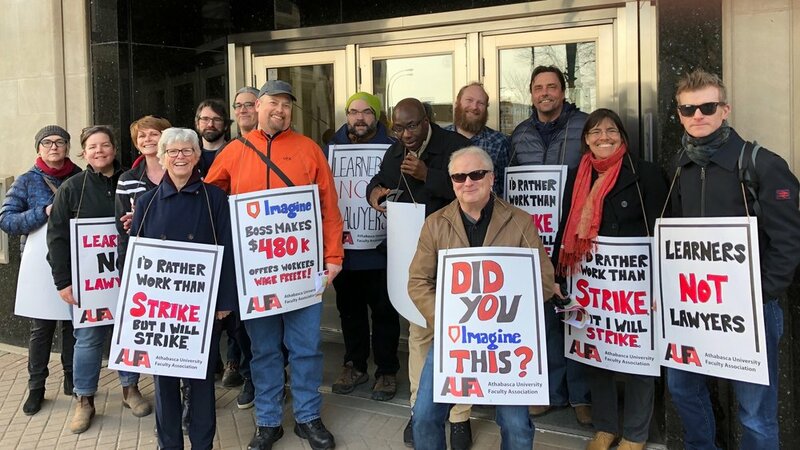 Indeed, it may be that AU is counting on AUFA’s member to be unwilling to strike and that explains their aggressive posture at the bargaining table. AUFA’s work stoppage team will continue its preparation. The immediate task is to conclude an Essential Services Agreement. This may entail applying to the LRB for adjudication by the Essential Services Commissioner.